I am a constant worrier – always have been, and likely always will be. It’s a natural side of my perfectionist, compulsive to do list-maker personality. I can easily get into a narrow, future-oriented mindset that prevents me from enjoying life happening right now. Sounds familiar to you? Hm, I thought so. Sadly, this is how most people in our overachiever Western society live. When my thoughts begin to spiral down into this dark hole of “have to’s” and “should do’s”, I know I need to take a step back and be grateful for all the wonderful people I have in my life. I’ve talked before about how I have always had trouble making friends. I was always the nerd, the kid on the front row in class, the girl sitting by herself at lunch break. These days, when I list the people I consider my friends, to my utter surprise, I find I have more friends than I can count on both hands. I never thought I would be so lucky. I never thought so many people could like me. Could like me that much that they would want to keep in touch despite living 419 miles, or even 700 miles away from me. 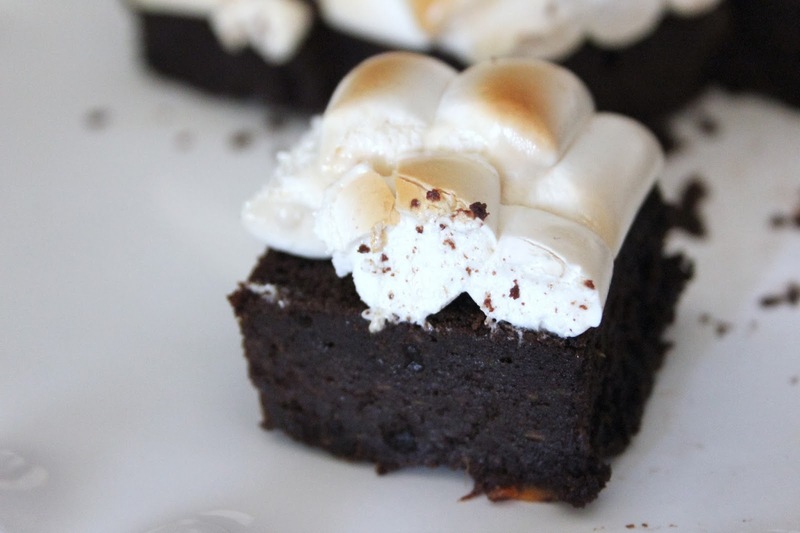 Could like me enough to want to hang out with me every Tuesday night to watch Brave, share a vegan meal with despite being avid meat-eaters, and eat my S’mores Sweet Potato Brownies. I truly, truly am the luckiest girl in the world. 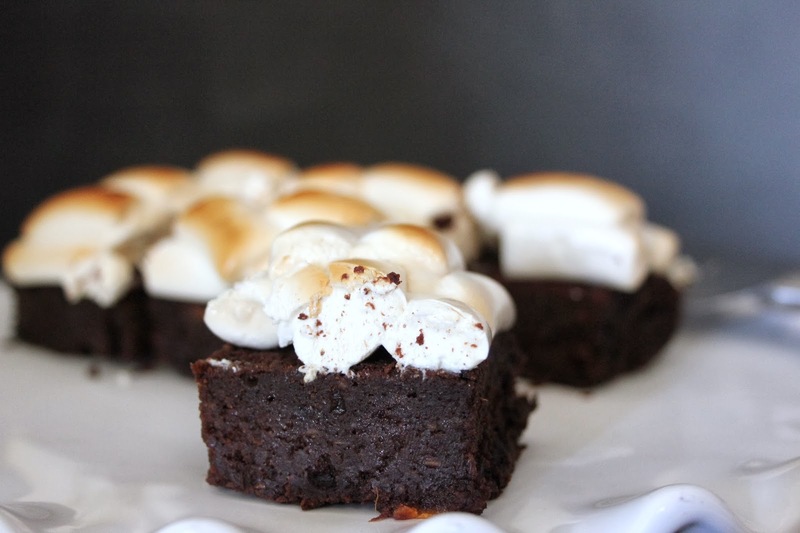 Inspired by S’mores Brownies in Jamie magazine. Note: To prepare the mashed roasted sweet potato you will need 2 medium-sized sweet potatoes. Pre-heat the oven to 200ºC. Half the sweet potatoes lengthways, drizzle their orange flesh with a tiny bit of oil, and pop into the oven on a baking tray for about 40-45 minutes. Remove from the oven, set aside to cool for a few minutes. Peel off their skins (and nibble them if you like; they’ll be caramelised and delicious). Mash the flesh with a fork. And on another note: You totally can’t taste the sweet potato. But man, it makes these brownies good. Ooey gooey good. Pour the hot water over the soft brown sugar, stir to dissolve. Combine with the oil, vanilla and sweet potato. In a large mixing bowl lightly combine the dry cocoa powder and self-raising flour with a fork. Fold in the dry ingredients. Stir until just combined to prevent over-mixing the batter. Pour the batter into the lined cake tin, scraping ever last morsel from the bowl. Bake for 20 minutes. Cook on a wire rack. Switch the oven setting to grill, but keep the temperature at 200ºC. 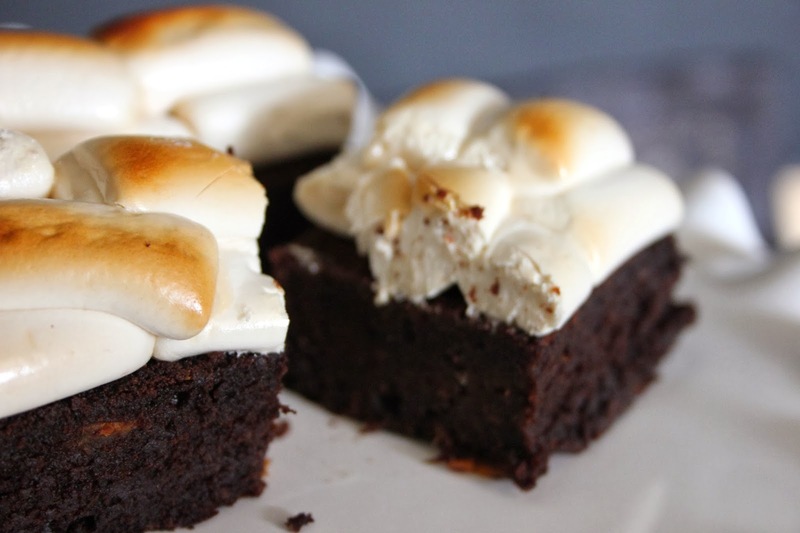 Cover the top of your brownies, still in their tin, with the marshmallows. If you have extras, tuck ’em in where they’ll fit. The more, the better. Pop the tin under the grill for 3-4 minutes. Keep a close eye on your brownies all the while. Remove from the oven and also immediately afterwards from the tin. Slice the cake while the marshmallows are still hot. These brownies are best enjoyed warm from the oven with a cup of cocoa and good friends to share. Tell me one thing that has surprised you for the better in your life? « Winner of The Vegan Kind Giveaway! It is a hard habit to break considering that's how we've made our society to function… but brownies will indeed always be there to save the day. And friends, of course! This is such a lovely post! I'm so pleased you're getting more secure in yourself and making lots of friends. I'm a terrible worrier too, albeit less so than in the past. I never thought of using vegan marshmallows as a topping, how ingenious. These look delicious Clem! Stress and worry made me ill but I'm dealing with it at long last, I can just block things out now. No point in dwelling on things any more, what will be, will be. Everyone feels like that at some points, chin up lovely girl! With regards to the brownies, after the bloggers bake sale last year I want smore of your baked treats! Yum! 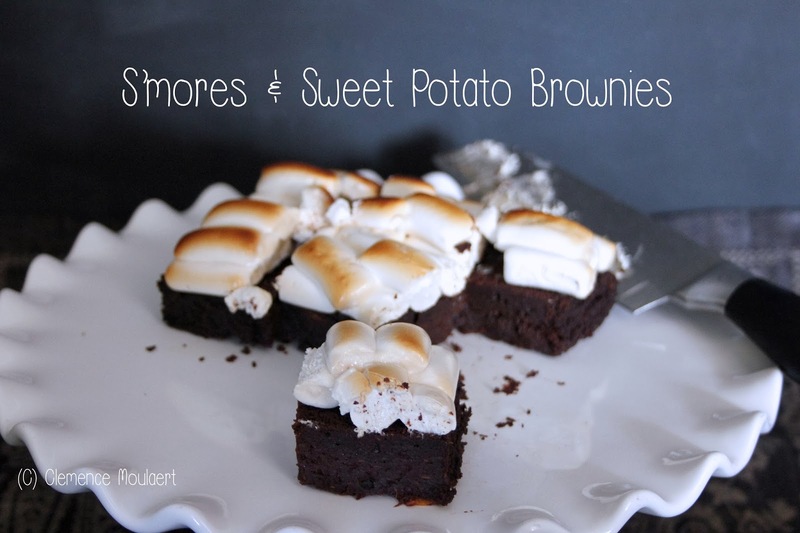 I so need to try these brownies. Just made these and they turned out wonderfully moist and delicious. I love that they don't have much sugar either. Thank you for this creative recipe. Thank you! I'm so pleased you liked them. They are by far the most delicious brownies I have ever made or tasted. You could try making them sugar-free by using stevia, though I haven't tried that yet. I think next time I might try using date syrup instead of hot water and sugar to see how they turn out. I just made these and the only way they are edible are with mostly marshmallow in the bite. they're not nearly sweet enough :[ maybe I did something wrong? followed directions to a t though.. :[ very disappointed, I was so excited for these. Oh dear, I'm sorry to hear that! Was your oven pre-heated properly? If they're not sweet enough, that could be because the sweet potatoes weren't roasted long enough, or maybe you've just got a bigger sweet tooth, so feel free to add more sugar.